It was a Davidvili versus Goliath kind of matchup, with Germany dominating the game most of the time. The defending world champion won 2-0 at Georgia. After experimenting with a back three in the last friendly match against Australia, Joachim Löw decided to come back to a 4-2-3-1/4-1-4-1 hybrid, with Toni Kroos and Bastian Schweinsteiger being fielded in central midfield. 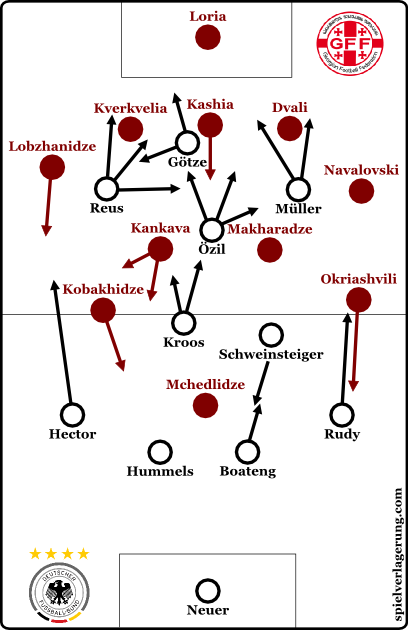 Moreover, Marco Reus and Thomas Müller played up front, while Mesut Özil tended to drop back into deeper midfield zones. The first half started with a set-back for the rank outsider, with veteran Alexander Amisulashvili going down injured after Germany’s first attack, and having to be subbed off shortly after. Lasha Dvali made his first appearance playing as left half-back, while Guram Kashia defended in the centre of the back five. Kashia has mostly played as holding player in the past. This time he frequently skipped back and forth between central defence, when Georgia were defending their box, and defensive midfield, when Kashia’s side were pressing higher up the pitch. As for Germany, Löw’s men up front had obviously been instructed to switch position consistently to confuse the opposing defence. Being physical imposing, Georgia’s marker displayed problems with Germany’s fluid movement right from the start. Georgia can dominate aerial duels, but has even more problems on the ground, when it comes to defending through balls. Reus and Müller usually moved inwards using diagonal runs, whereby the latter preferred his typical Raumdeuter-ish runs behind the defence, while Reus stepped into the space between Georgia’s lines. Meanwhile, Mario Götze spent his time in a nine-and-a-half role up front, allowing him to drop to the left half-space and link play rather than be stuck up front between physically superior centre-backs. While building up, Schweinsteiger clearly was the deeper part of Germany’s double pivot. The skipper sometimes dropped between the centre-backs or just served as safe open man, when Georgia attacked Kroos. The Real Madrid star mostly carried the ball from the back forwards, showing a couple of dynamic vertical runs which demanded too much of Georgia’s defence. Furthermore, Jérôme Boateng got occasionally involved in the build-up play, with Mats Hummels providing security for his team-mates. The Eurasians usually defended in a 5-4-1, with Mchedlidze behaving passively and staying up front as a constant focal point. In the first phase of their pressing both wingers stood narrowly. However, Georgia struggled to defend properly, when Germany attacked through the middle, as the world champion bypassed Georgia’s line easily. Plus, quick combination play, accurate lay offs and Müller as well as Reus using their freedom in the half-spaces were just too much for the brave hosting team. As they were not able to prevent the visitors from piecing together their attacking game, German’s clever control of the tempo was vital to achieving dominance. Additionally, Özil played an interesting role. The 26-year-old linked up in the right half-space, and while Kroos delivered longer passes from deeper positions, Özil looked for the right moment to play his threatening through balls. The hosts actually surprised with their counter attacking approaches. The outsiders did not use long balls. Instead, they tried to play quick combinations, but hardly had any chance against Germany’s counter pressing intensity. Interestingly, left winger Tornike Okriashvili was stuck to the touchline, while right winger Aleksandr Kobakhidze often drifted near Mchedlidze. Georgia held out for 38 minutes, but it was only a matter of time before Germany would found a breakthrough. Georgia lost the ball in a transition moment, with Hummels immediately delivering the ball back into the final third. Götze fought through a pack of defenders before he laid off to Reus who was on the scrounge for the goal. The shot caught goalkeeper Giorgi Loria off guard. Only five minutes later, Germany doubled the lead. Özil found Müller with a precise pass. The Bayern forward picked up a short rebound, finding a larger pocket of space to knock the ball past Loria. After avoiding any damage for almost 40 minutes, the match was already over when Georgia conceded two goals so quickly. Germany were, of course, the more dominant side, with a possession rate of 76%, while taking 14 shots, with seven being on target. Georgia’s coach Kakhaber Tskhadadze replaced bustling Okriashvili with Giorgi Chanturia after half-time. His team, however, progressively dropped deeper and deeper in the second half. Therefore, Germany still dominated the ball, but struggled to break through the Georgian defence, while the hosts almost brought everyone behind the ball. Admittedly, Germany soft-pedalled, controlling tempo, but not getting get the final ball to create danger. 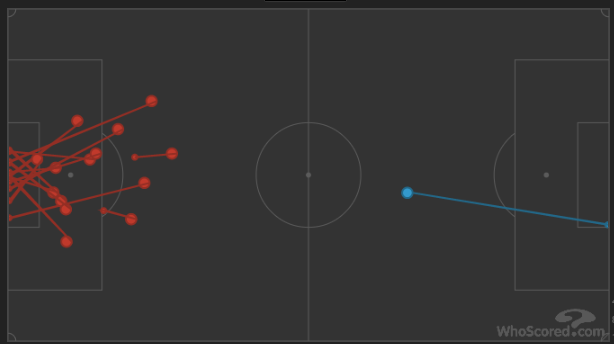 Though it was interesting to see throughout the game how controlled Germany’s offense was. Löw’s players chose their runs smoothly, displaying proper movement in the final third. High speed attacks are not always necessary. In the second 45 minutes, Götze and Müller sometimes dropped deeper to find some space in the pockets in front of Georgia’s defence and to have the opportunity to make runs behind the back line, while not being covered closely. 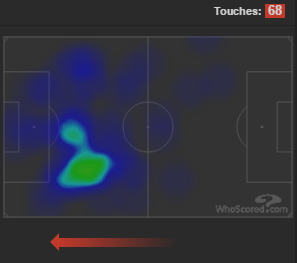 Sebastian Rudy got noticeably more involved as the right-back moved into the right half-space when Germany besieged the Georgian box. The world champions played back and forth not finding the right channels most of the time, but avoided to play too many crosses, which is remarkable, considering their displays lately. Eventually, it was an easy win, if perhaps not in convincing fashion as expected. Germany pierced the centre of Georgia’s midfield with quick attacks and great movement in the first half, displaying a penetrative side to their game, but were not able (or unwilling) to uphold their most threatening part of the game. However, Löw’s side can keep up at the top of their qualifying group. As expected, Georgia sit deep, but willingly showed short passing game when they had space on the break. They dealt with the occasion bravely. Two teams on a different level make it hard to judge the performance. Georgia might be satisfied with this result. But null points are null points and they can only hope that they’ll create more chances against other opponents. Germany was solid but took the foot off the pedal later on. It is always tough against a packed defence and the poorest player is the one striker up front. Doesn’t matter if it is Mario Götze or somebody else. Whoever plays as striker, his main role will be to open space for Reus and Müller or to lay the ball off for the attacking midfielders. However, it would be nice to see different players up front. Mario Gomez and Kevin Volland are the obvious candidates. All three players, when we include Götze, have a different style. Putting Müller or Reus upfront is not my preferred solution. Müller is great in searching free space and Reus has a good pace that he can use to move into forward positions. Both would be kind of wasted if they have to create space for others. At the back, well, kind of solid but hard to say after this game. Boateng is in great shape. Without a doubt the best German defender at the moment. Can’t say much about Hummels, I think it was a solid performance but let’s wait how everything turns out at the club. Nothing to worry about regarding the center backs, with Badstuber back and so forth. The fullbacks are called the weak spot and it is true that the big names (or the big name: Lahm) is missing. However, whether there is a problem or not depends on the requirements. If we look for a simple fullback (like the Duracell bunny) and not a creative force, it is more a question of match time that Low gives to his candidates. The other option is a change to a formation with wingbacks, but I doubt that many clubs in Germany developed any wingbacks over the last decade. Wingbacks won’t really change the problem that the position ‘defensive winger’ is considered weak. Wingbacks are more of a result of other tactical changes than a solution for a problem. Maybe Low will play more often with a back three, which he has great players for, wingbacks would be a consequence. Of course a wingback can play a more attacking role compared to a fullback and therefore different players are needed. But still, there are not many (or any?) German players used to play wingback at club level. So it is all about getting used to this role at the national team.